Mozart’s violin sonatas span his entire career—the early ones are billed as piano sonatas with optional violin accompaniment—and they develop over the years into the first triumphs of the modern genre. 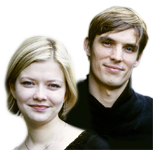 Alina Ibragimova and Cédric Tiberghien have been enthralling audiences worldwide with these works, and now the first instalment is available as a highly desirable 2-for-1 album. Mozart’s first sonatas for piano and violin were composed during the European tour that took his family to Paris, London and The Hague in 1763–1766. Writing from Paris to his Salzburg landlady, Maria Theresia Hagenauer, in February 1764, Leopold Mozart proudly told her: ‘Four sonatas by Mr Wolfgang Mozart are now at the engraver’s. Imagine the noise these sonatas will make in the world when it states on the title-page that they are the work of a child of seven years.’ The sonatas, K6–9, were Mozart’s earliest published compositions, and they appeared shortly afterwards in two volumes, as his Opp 1 and 2, with a title-page describing them as Sonates pour le Clavecin qui peuvent se jouer avec L’accompagnement de violon (‘Harpsichord sonatas which may be played with violin accompaniment’). In April of the same year the Mozarts travelled on to London, and it was there, ten days or so before Wolfgang’s ninth birthday, that his Op 3 appeared: a set of six sonatas (K10–15) for harpsichord with an accompaniment for violin or flute. A second edition issued shortly afterwards contained an optional part for cello, so that the pieces could be performed as piano trios. The tally of Mozart’s early sonatas with violin was completed with a further set of six works, K26–31, composed in The Hague in February 1766. All these early works grew out of a popular form of domestic music-making now known as the ‘accompanied piano sonata’, in which the non-keyboard instruments had no independent melodic material of their own, so that if no additional players were available the music could quite satisfactorily be played as a solo sonata. Among the leading practitioners of the genre were such composers as Johann Schobert and Johann Eckard, both of whom had visited the Mozart family in Paris, and had presented Wolfgang and his sister Nannerl with copies of their sonatas. Mozart is known to have modelled his sonatas for harpsichord and violin on specific works by Schobert and Eckard, and he included arrangements of sonata movements by both these expatriate German composers in his series of pasticcio piano concertos, K37–41. The six sonatas K10–15 were dedicated to Queen Charlotte, the wife of George III. The Mozarts were received at Buckingham House (now Palace) no fewer than three times during their London visit, so the eight-year-old composer would have had ample opportunity to play his new sonatas to the royal couple. Certainly, the opening movement of the first work in the series, the Sonata in B flat major, K10, was tailor-made to show off his keyboard facility, with rapid skips of the left hand over the right, and the greater part of the piece written in a patter of ‘Alberti’-bass figuration. The middle movement’s melody has a ‘rocking’ left-hand accompaniment, and the octave leaps in its central development section are echoed by the violin. The finale, as in several of these early sonatas, is a minuet and trio. Perhaps the most striking moment of the Sonata in C major, K14, is its opening, with an impetuous scale-like figure that gives the impression of music beginning in mid-stream. But the work’s most unusual feature is the trio of the minuet (or ‘Menuetto II’, as it is labelled), with its pizzicato accompaniment. It is described as being ‘En carillon’, and the bell-like effect Mozart had in mind can be conveyed, as it is on the present recording, through the use of the sustaining pedal. Mozart’s next group of sonatas with violin was dedicated to Princess Caroline of the Netherlands, the daughter of William IV of Orange. With the exception of the first of them, with its expressive C minor middle movement, these new pieces, K26–31, are all cast in two movements. The Sonata in F major, K30, opens with an Adagio in which the keyboard player’s right hand constantly crosses over the left, punctuating the melody with a bass line that drops through an octave. The left-hand accompaniment unfolds in smooth triplets, and the closing moments of each half of the piece seem to peer momentarily across the years to the famous slow movement, also in hypnotically reiterated triplets, of the C major piano concerto K467. In the concluding rondo the final reprise is interrupted by a passage in which the rondo theme finds itself transformed into the minor, and into an expressive Adagio. The moment is one that lends the sonata’s closing stages an unexpected air of tragedy. In September 1777 Mozart and his mother set off on a prolonged journey that was to take them to Munich, Mannheim and Paris. It was in Mannheim that Mozart began to write a set of six violin sonatas which he completed in the spring of 1778 in Paris, with the sonatas in E minor, K304, and D major, K306. During his stay in Mannheim Mozart made the acquaintance of a wealthy Dutch amateur flautist by the name of Ferdinand Dejean, who commissioned him to write three flute concertos as well as a number of quartets. Mozart managed to complete only two of the concertos and two quartets; but there is evidence to suggest that the Sonata in G major, K301, for piano and violin had also originally been intended for Dejean. Its opening stage was written with the flute in mind, before Mozart had a change of heart. In adapting the music for violin, he was able to take advantage of the stringed instrument’s wider range, and to shift several passages into a lower register. From the G major sonata’s very first bars we can see how radically Mozart’s approach to the medium had changed since his early works of the kind: the main subject is now given out by the violin, before being answered by the piano. The unifying thread that runs through the first movement is the emphatic idea given out in octaves by both players as a form of punctuation mark between the theme’s two statements. The same idea in more subdued form provides a transition to the principal second subject, and it returns above a throbbing repeated pedal-note on the piano to round off the movement’s first stage. More strikingly still, the central development section is framed by two further appearances of the same passage, played once again in forceful octaves—first, at the start of the section, in inversion; and then, as a lead-in to the recapitulation, in its original form. 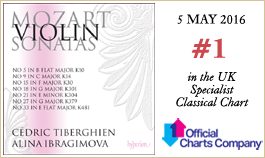 All but the last in the series of sonatas K301–306 are in two movements only, and in the majority of them Mozart compensates for the absence of a slow movement by writing the finale in a moderate tempo. Exceptionally, however, K301 is made up of two Allegros. All the same, the second of them is a graceful, waltz-like piece in a simple ternary design, with a central episode in the minor whose siciliano-like melody is entrusted to the violin throughout. The reprise follows the plan of the opening section exactly, but Mozart adds a lilting coda which brings the sonata to a close of considerable charm. Among the six violin sonatas of 1778, it is the quietly tragic Sonata in E minor, K304—Mozart’s only composition in this key—that leaves the deepest impression. Both the austere character of its opening movement and the haunting nostalgia of its minuet-style finale place it apart from its companions. When Mozart begins a work with a theme in subdued bare octaves, as he does here, that beginning more often than not presages an unexpected harmonization of the same theme at a later stage. In this case, the harmonized version occurs at the start of the recapitulation. It is, indeed, so intensely chromatic that it momentarily gives the impression that the preceding development section is continuing. The sotto voce minuet theme of the second movement, with its descending bass line (chromatically intensified in the melody’s second half), is one that carries an infinite feeling of melancholy. Even so, the theme is surpassed in expressive intensity by the movement’s major-mode middle section. The return to the minor brings with it a new accompanimental figure in smooth triplets, though its more flowing motion serves only to set in relief a coda whose halting phrases seem stricken with grief. On 12 March 1781 Mozart was summoned by his employer, the Prince-Archbishop of Salzburg, to join him and his retinue in Vienna, where they were staying during the celebrations marking the accession of the Emperor Joseph II. Mozart had been in Munich since the previous November, preparing for the premiere there of his opera Idomeneo, and he arrived in the Austrian capital on 16 March. That evening he found himself obliged to organize a private concert centred around the talents of some of the Salzburg court musicians. Mozart’s deep resentment towards the Archbishop, who refused to grant him permission to perform in public, can be discerned from his letters of the time to his father. Three weeks after his arrival in Vienna, Mozart had to provide pieces for the leader of the Salzburg orchestra, Antonio Brunetti, for whom he wrote a Rondo for violin and orchestra (K373), and the Sonata in G major, K379. The latter was so hurriedly composed (Mozart claimed to have completed it within the space of a single hour) that there was no time to write out the piano part, and Mozart had to play it out of his head at the work’s premiere the following day. 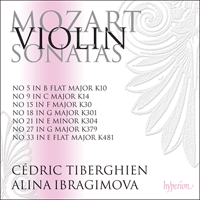 Despite the circumstances in which it was written, this is one of the most beautiful and original of all Mozart’s violin sonatas. It is one that was well known to Schubert, who based his only song in variation form, Im Frühling, D882, on a theme very similar to that of Mozart’s variation finale. The sonata begins with an elaborate Adagio—a sonata movement in its own right, complete with a repeat of its exposition, although the music breaks off at the moment where we would have expected the recapitulation to set in. At this point Mozart instead writes an agitated Allegro in the minor. An unusual feature of this restless movement is that its central development section occupies no more than ten bars. Mozart compensates for its brevity by expanding the scope of the recapitulation, interpolating further development which drives the music forward to its turbulent close. The gently rustling trills of the finale’s theme are no mere ornament, but an integral part of the melody, and they return in one form or another in almost all of the variations that follow. The exceptions are the first variation, for the piano alone, which transforms the melody into a freely floating three-part invention; and the intricate Adagio fifth variation, where the piano’s elaborate flights of fantasy are accompanied by the dry sound of violin pizzicato—a wonderfully effective idea. The Adagio is preceded by a variation in the minor, and followed by a reprise of the original theme. The reprise, however, is in a more flowing tempo, and the increase in urgency is one that significantly alters its character. So, too, does the coda, which sets out with more brilliant figuration, though in the end Mozart is content to allow the work to come to a gently understated conclusion. Mozart completed the imposing Sonata in E flat major, K481, on 12 December 1785, just four days before his piano concerto in the same key K482. In the last variation of the sonata’s finale, with its ‘hunting’ undertones, we seem to hear a pre-echo of the concerto’s concluding rondo; and the chamber work’s closing bars are also conceived very much in orchestral terms. The unusually quick opening movement—a three-to-the-bar Molto allegro—is on a large scale, with no fewer than three contrasting themes. Despite the abundance of material, Mozart opts to base the development section on a new idea—a four-note violin motif in long notes, more familiar from its use as the main subject of the ‘Jupiter’ Symphony’s finale. As he so often does when introducing new material in the development, Mozart brings back the same motif in the movement’s coda. The slow movement is one of Mozart’s most profound, and its enharmonic changes of key are among his most remarkable experiments, with the music moving at one point from ‘flat’ to ‘sharp’ regions and back again with startling rapidity, and with the two instruments—and even the pianist’s right and left hands—notated briefly in different key signatures simultaneously. At the central point of the passage in question the main theme of this A flat major movement appears in the very remote key of A major, and Mozart renews the expedition into distant territory during the closing moments of the piece by moving within the space of a mere half-dozen bars from A flat major to E major and back again. The A major excursion allows the violin momentarily to take over the main theme; but for the rest, that theme is confined to the piano, with the violin taking off between its various appearances in a series of passionate, soaring episodes. The main theme itself becomes ever more intricately ornamented during the course of the movement, until in its final reprise it appears shrouded in trills. The theme of the concluding variation movement is laid out in striking fashion, with the melody played by the two instruments in octaves, and a single-line accompaniment in the pianist’s left hand. Mozart was pleased enough with his transparent two-part texture to recall it some three years later in the variation movement of his string trio Divertimento, K563, also in E flat major. The sonata’s variations unfold in leisurely fashion, largely eschewing the traditional increase in brilliance from one variation to the next. Only in the penultimate variation is the music enlivened with more animated figuration. Here, Mozart presents a double variation, with each half varied in a quasi-repeat which has the pianist’s left-hand semiquaver triplets replaced with notes of even shorter value for the right hand, before a coda leads to a concluding variation in ‘hunting’ style. Mozart composa ses premières sonates pour piano et violon au cours d’une tournée européenne qui conduisit sa famille à Paris, Londres et La Haye en 1763–1766. Dans une lettre adressée de Paris à sa logeuse salzbourgeoise, Maria Theresia Hagenauer, en février 1764, Leopold Mozart écrivait avec fierté: «Quatre sonates de M. Wolfgang Mozart sont à présent chez le graveur. Imaginez le bruit que ces sonates vont faire dans le monde lorsqu’il est spécifié sur la page de titre qu’elles sont l’œuvre d’un enfant de sept ans.» Les sonates, K 6–9, furent les premières compositions publiées de Mozart et elles parurent peu après en deux volumes, sous les numéros d’opus 1 et 2, avec une page de titre les décrivant comme des Sonates pour le Clavecin qui peuvent se jouer avec L’accompagnement de violon. En avril de la même année, les Mozart poursuivirent leur voyage à Londres et c’est dans cette ville, à peu près dix jours après le neuvième anniversaire de Wolfgang, que fut publié son op.3: un recueil de six sonates (K 10–15) pour clavecin avec un accompagnement de violon ou de flûte. Une deuxième édition, sortie peu après, contenait une partie optionnelle de violoncelle pour que les morceaux puissent être joués comme des trios avec piano. L’ensemble des premières sonates avec violon de Mozart fut complété par un autre recueil de six œuvres, K 26–31, composées à La Haye en février 1766. Toutes ces œuvres de jeunesse relèvent d’une forme répandue de pratique musicale domestique connue aujourd’hui sous le nom de «sonate pour piano avec accompagnement»; les instruments en dehors du clavecin n’avaient aucun matériel mélodique indépendant qui leur soit propre, ce qui permettait de jouer cette musique de manière satisfaisante comme des sonates en solo si l’on ne disposait pas d’instrumentistes supplémentaires. Parmi les adeptes du genre figuraient des compositeurs comme Johann Schobert et Johann Eckard, qui avaient tous deux rendu visite à la famille Mozart à Paris et avaient apporté à Wolfgang et à sa sœur Nannerl des exemplaires de leurs sonates. On sait que Mozart modela ses sonates pour clavecin et violon sur des œuvres spécifiques de Schobert et Eckard et il inclut des arrangements de mouvements de sonates de ces deux compositeurs allemands expatriés dans sa série de concertos pour piano pasticcio, K 37–41. Les six sonates K 10–15 sont dédiées à la Reine Charlotte, épouse de George III. Les Mozart furent reçus au moins trois fois à Buckingham House (aujourd’hui Buckingham Palace) au cours de leur visite à Londres, et le compositeur âgé de huit ans dût avoir largement l’occasion de jouer ses nouvelles sonates au couple royal. Le mouvement initial de la première œuvre de la série, la Sonate en si bémol majeur, K 10, fut certainement conçu spécialement pour mettre en valeur son talent au clavier, avec des sauts rapides de la main gauche au-dessus de la main droite et la majeure partie du morceau écrite dans un crépitement en basse d’«Alberti». La mélodie du mouvement central repose sur un accompagnement «oscillant» à la main gauche, et les sauts d’octaves du développement central sont repris par le violon. Comme dans plusieurs de ces sonates de jeunesse, le finale est un menuet avec trio. Le moment le plus frappant de la Sonate en ut majeur, K 14, est peut-être son début, avec une impétueuse figure en forme de gamme qui donne l’impression que la musique commence en plein milieu d’une phrase. Mais la caractéristique la plus inhabituelle de cette œuvre est le trio du menuet (ou «Menuetto II», comme il est étiqueté), avec son accompagnement pizzicato. Il porte la mention «En carillon» et l’effet de cloches auquel pensait Mozart peut se traduire, comme c’est le cas dans cet enregistrement, par l’utilisation de la pédale forte. Le groupe de sonates avec violon de Mozart qui suit est dédié à la Princesse Caroline des Pays-Bas, fille de Guillaume IV d’Orange. À l’exception de la première d’entre elles, avec son mouvement central expressif en ut mineur, ces nouvelles pièces, K 26–31, sont toutes écrites en deux mouvements. La Sonate en fa majeur, K 30, commence par un Adagio où la main droite de l’instrumentiste à clavier croise constamment la main gauche, ponctuant la mélodie avec la basse qui descend d’une octave. L’accompagnement de la main gauche se déroule en triolets fluides et les moments conclusifs de chaque moitié du morceau semblent annoncer par moment le célèbre mouvement lent, également en triolets répétés de façon hypnotique, du Concerto pour piano en ut majeur, K 467. Dans le rondo final, la dernière reprise est interrompue par un passage où le thème du rondo passe en mineur, transformé en un Adagio expressif. Ce moment prête à la conclusion de cette sonate un air inattendu de tragédie. En septembre 1777, Mozart et sa mère entreprirent un long voyage qui allait les conduire à Munich, Mannheim et Paris. C’est à Mannheim que Mozart commença à écrire un recueil de six sonates pour violon et piano qu’il acheva au printemps 1778 à Paris, avec les sonates en mi mineur, K 304, et en ré majeur, K 306. Pendant son séjour à Mannheim, Mozart fit la connaissance d’un riche flûtiste amateur néerlandais du nom de Ferdinand Dejean, qui lui commanda trois concertos pour flûte ainsi que plusieurs quatuors. Mozart ne réussit à achever que deux des concertos et deux quatuors; mais on a de bonnes raisons de supposer que la Sonate en sol majeur, K 301, pour piano et violon était aussi, à l’origine, destinée à Dejean. Le début fut écrit en pensant à la flûte, avant que Mozart changea d’idée. En adaptant sa musique au violon, il put tirer avantage de la tessiture plus large de l’instrument à cordes et déplacer plusieurs passages dans un registre plus grave. Les toutes premières mesures de la Sonate en sol majeur permettent de voir à quel point l’approche mozartienne avait changé depuis ses premières œuvres du genre: le sujet principal est maintenant exposé par le violon, avant que le piano n’y réponde. Le fil unificateur qui parcourt le premier mouvement est l’idée catégorique donnée en octaves par les deux instrumentistes comme une sorte de signe de ponctuation entre les deux expositions du thème. La même idée, sous une forme plus contenue, fournit une transition vers le second sujet principal et revient sur une pédale lancinante répétée au piano pour conclure la première phase du mouvement. De manière encore plus frappante, le développement central est encadré par deux autres apparitions du même passage, jouées une fois encore en octaves vigoureuses—tout d’abord au début de la section, en renversement, puis, comme préambule à la réexposition, sous sa forme originale. Toutes les sonates de la série K 301–306, sauf la dernière, sont en deux mouvements seulement et, dans la majorité d’entre elles, Mozart compense l’absence de mouvement lent en écrivant le finale dans un tempo modéré. Toutefois, à titre d’exception, le K 301 se compose de deux Allegros. Le second est tout de même une pièce gracieuse dans le style d’une valse de simple conception ternaire, avec un épisode central en mineur dont la mélodie en forme de sicilienne est confiée au violon du début à la fin. La reprise suit exactement le plan du début, mais Mozart ajoute une coda mélodieuse qui mène cette sonate à une conclusion au charme considérable. Parmi les six sonates pour violon et piano de 1778, c’est la Sonate en mi mineur, K 304, doucement tragique—la seule composition de Mozart dans cette tonalité—qui laisse la plus profonde impression. Le caractère austère du mouvement initial comme la nostalgie lancinante de son finale dans le style d’un menuet la différencient de ses compagnes. Lorsque Mozart commence une œuvre avec un thème en octaves contenues à découvert, comme il le fait ici, un tel début présage plus souvent qu’à son tour une harmonisation inattendue du même thème à une phase ultérieure. Dans le cas présent, cette version harmonisée survient au début de la réexposition. Elle est en fait si intensément chromatique qu’elle donne momentanément l’impression que le développement précédent se poursuit. Le thème du menuet sotto voce du second mouvement, avec sa basse descendante (intensifiée de manière chromatique dans la seconde moitié de la mélodie) traduit une impression infinie de mélancolie. Le thème est quand même surpassé en intensité expressive par la section centrale du mouvement en majeur. Le retour au mineur amène une nouvelle figure d’accompagnement en triolets fluides, même si son mouvement plus coulant ne sert qu’à mettre en relief une coda dont les phrases hésitantes semblent accablées de douleur. Le 12 mars 1781, Mozart fut sommé par son employeur, le prince-archevêque de Salzbourg, de le rejoindre à Vienne, où il séjournait avec son escorte pendant les célébrations marquant l’accession au trône de l’empereur Joseph II. Mozart était à Munich depuis le mois de novembre précédent, préparant la première représentation de son opéra Idomeneo, et il arriva le 16 mars dans la capitale autrichienne. Ce soir-là, il se trouva obligé d’organiser un concert privé centré sur les talents de quelques musiciens de la cour de Salzbourg. Dans les lettres qu’il adressa alors à son père, on peut mesurer le profond ressentiment de Mozart envers l’archevêque, qui refusait de lui donner la permission de jouer en public. Trois semaines après son arrivée à Vienne, Mozart dût fournir des morceaux pour le violon solo de l’orchestre de Salzbourg, Antonio Brunetti, pour qui il écrivit un Rondo pour violon et orchestre (K 373) et la Sonate en sol majeur, K 379. Mozart composa cette dernière en toute hâte (il affirmait l’avoir achevée en une heure seulement) et n’eut pas le temps de coucher sur le papier la partie de piano qu’il dût jouer de mémoire lors de la création de l’œuvre, le lendemain. Malgré les circonstances dans lesquelles elle fut écrite, c’est l’une des plus belles et plus originales sonates pour violon et piano de Mozart. Elle était bien connue de Schubert, qui basa son seul lied en forme de variations, Im Frühling, D 882, sur un thème très proche de celui du finale en variations de Mozart. La sonate débute par un Adagio élaboré—un mouvement de sonate à part entière, avec une reprise de son exposition, bien que la musique s’interrompe au moment où l’on aurait attendu l’arrivée de la réexposition. À la place, Mozart écrit alors un Allegro agité en mineur, mouvement impétueux qui comporte une caractéristique inhabituelle: son développement central n’occupe pas plus de dix mesures. Mozart compense cette concision en augmentant l’étendue de la réexposition, insérant un autre développement qui mène la musique à sa conclusion turbulente. Les trilles bruissant doucement du thème du finale ne sont pas de simples ornements, mais font partie intégrante de la mélodie et reviennent sous une forme ou une autre dans presque toutes les variations qui suivent. Les exceptions sont la première variation, pour le piano seul, qui transforme la mélodie en invention à trois voix flottant librement; et la cinquième variation, un Adagio complexe, où les envolées fantaisistes et élaborées du piano sont accompagnées du son sec du pizzicato du violon—une merveilleuse idée de grand effet. L’Adagio est précédé d’une variation en mode mineur et suivi d’une reprise du thème original. Toutefois, cette reprise s’effectue dans un tempo plus fluide et l’augmentation de l’urgence en modifie considérablement le caractère. Il en va de même de la coda, qui commence avec une figuration plus brillante, mais à la fin Mozart se contente de permettre à cette œuvre d’arriver à une conclusion douce et discrète. Mozart acheva l’imposante Sonate en mi bémol majeur, K 481, le 12 décembre 1785, quatre jours seulement avant son concerto pour piano de même tonalité, K 482. Dans la dernière variation du finale de la sonate, avec ses échos de «chasse», on a l’impression d’entendre une anticipation du rondo final du concerto; et les dernières mesures de l’œuvre de musique de chambre sont aussi largement conçues en termes orchestraux. Le mouvement initial d’une rapidité inhabituelle—un Molto allegro à trois temps—est de grande envergure, avec pas moins de trois thèmes contrastés. Malgré l’abondance de matériel, Mozart décide de baser le développement sur une nouvelle idée—un motif de violon de quatre notes en valeurs longues, que l’on connaît davantage par l’usage qu’il en fait comme sujet principal du finale de la Symphonie «Jupiter». Comme il procède si souvent lorsqu’il introduit du matériel nouveau dans un développement, Mozart ramène le même motif dans la coda. Le mouvement lent est l’un des plus profonds de Mozart et ses changements de tonalité enharmoniques comptent parmi ses expériences les plus remarquables, la musique passant à un endroit de régions «bémolisées» à des régions «diésées» et inversement avec une rapidité surprenante, et les deux instruments—et même les mains droite et gauche du pianiste—étant notés brièvement dans différentes armatures simultanément. Au point central du passage en question, le thème principal de ce mouvement en la bémol majeur apparaît dans la tonalité très éloignée de la majeur, et Mozart renouvelle l’expédition dans un territoire distant au cours des derniers moments du morceau en passant, en l’espace d’une demi-douzaine de mesures seulement, de la bémol majeur à mi majeur et inversement. L’excursion en la majeur permet au violon de s’emparer momentanément du thème principal; mais pour le reste, ce thème reste confiné au piano, le violon décollant entre ses diverses apparitions en une série d’épisodes passionnés. Le thème principal lui-même est ornementé de manière toujours plus complexe au cours du mouvement, jusqu’à ce que, dans sa reprise finale, il apparaisse enveloppé de trilles. Le thème des variations finales est conçu d’une manière frappante, avec la mélodie jouée par les deux instruments à l’octave, accompagnée d’une seule ligne à la main gauche du pianiste. Mozart était assez content de sa texture transparente à deux voix pour la rappeler trois ans plus tard dans les variations de son Divertimento pour trio à cordes, K 563, également en mi bémol majeur. Les variations de la sonate se déroulent calmement, évitant en général la traditionnelle montée en puissance d’éclat d’une variation à la suivante. C’est seulement dans l’avant-dernière variation que la musique s’anime avec une figuration plus vivante. Ici, Mozart présente une double variation, chaque moitié étant variée en une quasi-reprise où les triolets en doubles croches de la main gauche du pianiste sont remplacés par des notes d’une valeur encore plus courte à la main droite, avant qu’une coda mène à une variation finale dans le style de la «chasse». Seine ersten Sonaten für Klavier und Violine komponierte Mozart während der Europareise, die ihn und seine Familie von 1763 bis 1766 nach Paris, London und Den Haag führte. Stolz schrieb Leopold Mozart im Februar 1764 an seine Vermieterin Maria Theresia Hagenauer: „Nun sind 4 Sonaten von Mr. Wolfgang Mozart beym stechen. Stellen sie sich den Lermen für, den diese Sonaten in der Welt machen werden, wann am Titlblat stehet daß es ein Werk eines Kindes von 7 Jahren ist.“ Die Sonaten KV 6–9 zählen zu seinen ersten Veröffentlichungen; sie erschienen in zwei Bänden als Opus 1 und Opus 2. Auf der Titelseite heißt es: Sonates pour le Clavecin qui peuvent se jouer avec L’accompagnement de violon („Sonaten für Cembalo, die mit Begleitung der Violine gespielt werden können“). Im April desselben Jahres ging die Reise weiter nach London. Dort erschien etwa zehn Tage vor Wolfgangs neuntem Geburtstag sein Opus 3, eine Sammlung von sechs Sonaten (KV 10–15) für Cembalo mit Begleitung von Violine oder Flöte. Eine zweite, kurz darauf veröffentlichte Ausgabe enthielt eine Stimme für Cello ad libitum, sodass die Stücke als Klaviertrios musiziert werden konnten. Vervollständigt werden die frühen Violinsonaten Mozarts durch eine weitere Sechsersammlung (KV 26–31), komponiert in Den Haag im Februar 1766. Diese Werke entsprangen einer beliebten Hausmusikpraxis, die heute als „begleitete Klaviersonate“ bekannt ist: Die Melodie- oder Bassinstrumente hatten kein eigenständiges melodisches Material; standen keine zur Verfügung, so konnte das Stück immer noch als Klaviersonate musiziert werden. Führend tätig waren in diesem Genre unter anderem Johann Schobert und Johann Eckard, die beide die Familie Mozart in Paris besuchten und Wolfgang und Nannerl Drucke ihrer Sonaten schenkten. Bekannt ist, dass Mozart seine Sonaten für Cembalo und Violine nach bestimmten Vorbildern Schoberts und Eckards formte; zu seinen Pasticcio-Klavierkonzerten KV 37–41 zählen Bearbeitungen von Sonatensätzen der beiden deutschen Komponisten. Die sechs Sonaten KV 10–15 sind Königin Charlotte gewidmet, der Frau Georgs III. Während ihres London-Aufenthalts wurden die Mozarts nicht weniger als dreimal im Buckingham House empfangen, dem heutigen Buckingham Palace; der achtjährige Komponist hatte also häufig Gelegenheit, seine Sonaten vor dem königlichen Paar zu spielen. Der Eröffnungssatz in der ersten Sonate der Reihe, der Sonate B-Dur, KV 10, war zweifellos darauf angelegt, seine Tastenfertigkeit vorzuführen, darunter rasches Übergreifen der linken über die rechte Hand und rastlose Alberti-Bässe im Großteil des Satzes. Die Melodie des Mittelsatzes wird von einer wiegenden Begleitfigur getragen; die Oktavsprünge im Mittelteil werden von der Violine nachgeahmt. Das Finale bildet, wie in vielen der frühen Sonaten, ein Menuett mit Trio. Der vielleicht eindrücklichste Moment der C-Dur-Sonate, KV 14, ist ihr Beginn: Eine schwungvolle Skalenfigur erweckt den Eindruck, mitten in die Musik zu springen. Der ungewöhnlichste Abschnitt des Werks ist jedoch das Trio („Menuetto II“) des Menuetts mit seiner Pizzicato-Begleitung. Es trägt die Bezeichnung „En carillon“, und der Glockeneffekt, den Mozart im Sinn hatte, lässt sich—wie in dieser Aufnahme—mit dem Pedal erzielen. Die nächste Gruppe von Sonaten mit Violine ist Prinzessin Caroline der Niederlande gewidmet, der Tochter Wilhelms IV. von Oranien. Mit Ausnahme der ersten Sonate mit ihrem ausdrucksstarken Mittelsatz in c-Moll sind die Sonaten KV 26–31 sämtlich zweisätzig angelegt. Die Sonate F-Dur, KV 30, beginnt mit einem Adagio, in dem die rechte Hand des Tastenspielers regelmäßig über die Linke greift und die Melodie mit Oktavfällen im Bass gliedert. Die Begleitung der linken Hand entfaltet sich in weichen Triolen, und die Abschlüsse der beiden Teile des Satzes scheinen einen Blick in die Zukunft zu tun: Sie erinnern an den berühmten langsamen Satz des C-Dur-Klavierkonzerts KV 467, ebenfalls in hypnotisch wiederholten Triolen. Im Schlussrondo wird das letzte Ritornell von einer Passage unterbrochen, in der das Rondo-Thema in Moll als ausdrucksvolles Adagio erklingt. Dieser kurze Augenblick verleiht dem Schluss der Sonate einen unerwartet tragischen Akzent. Im September 1777 brachen Mozart und seine Mutter zu einer langen Reise auf, die sie nach München, Mannheim und Paris führen sollte. In Mannheim begann Mozart mit der Komposition einer Reihe von sechs Sonaten, die er 1778 in Paris abschloss mit den Sonaten in e-Moll, KV 304, und D-Dur, KV 306. In Mannheim machte Mozart die Bekanntschaft des wohlhabenden niederländischen Amateurflötisten Ferdinand Dejean, der drei Flötenkonzerte und eine Anzahl Quartette bei ihm bestellte. Mozart konnte nur jeweils zwei Konzerte und Quartette fertigstellen; doch gibt es Hinweise, dass die Sonate G-Dur, KV 301, ursprünglich auch für Dejean bestimmt war. Sein Beginn wurde zunächst mit der Flöte im Sinn konzipiert, doch dann änderte Mozart seine Absicht. Er passte die Musik an die Violine an, nutzte dabei deren größeren Tonumfang und legte einige Abschnitte in tiefere Lage. Von den ersten Takten der G-Dur-Sonate an ist erkennbar, wie stark sich Mozarts Umgang mit dem Genre seit seinen frühen Sonaten gewandelt hat. Das Hauptthema spielt nun die Violine, erst dann antwortet das Klavier. Zusammengehalten wird der erste Satz von dem emphatischen Unisono-Motiv, das gleichsam als Satzzeichen zwischen den beiden Durchläufen des Themas steht. Dasselbe Motiv erscheint, leicht zurückgenommen, als Überleitung zum Seitensatz und kehrt in der Schlussgruppe des ersten Teils über pochender Klavierbegleitung noch einmal wieder. Noch auffälliger ist, dass zwei weitere Einsätze desselben Motivs die zentrale Durchführung umrahmen, abermals in kraftvollen Oktaven: zur Eröffnung in Umkehrung, zum Abschluss und als Rückleitung zur Reprise in der ursprünglichen Gestalt. Bis auf die letzte sind alle Sonaten der Gruppe KV 301–306 zweisätzig gehalten; in den meisten gleicht Mozart das Fehlen eines langsamen Satzes dadurch aus, dass das Finale in gemäßigtem Tempo steht. Die Ausnahme bildet hier die G-Dur-Sonate KV 301 mit ihren zwei Allegros. Das zweite ist gleichwohl ein graziöser, walzerartiger Satz in schlichter dreiteiliger Form; im Moll-Mittelteil ist die sicilianoartige Melodie ganz der Violine anvertraut. 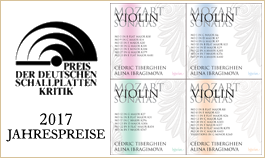 Die Reprise entspricht dem ersten Teil, doch fügt Mozart eine spielerische Coda an, die die Sonate zu einem zauberhaften Abschluss bringt. Von den sechs Violinsonaten des Jahren 1778 hinterlässt die verhalten-tragische e-Moll-Sonate KV 304, die einzige Komposition Mozarts in dieser Tonart, den stärksten Eindruck. Sowohl die Strenge des Kopfsatzes als auch die Melancholie des Menuett-Finales zeichnen sie vor ihren Schwesterwerken aus. Wenn Mozart ein Stück mit einem Thema in halblautem Unisono beginnt, so ist meistens zu einem späteren Zeitpunkt eine überraschende Harmonisierung zu erwarten. Hier erscheint sie zu Beginn der Reprise. Sie ist dabei so stark chromatisiert, dass der Eindruck entsteht, die Durchführung ginge einfach weiter. Das sotto-voce-Thema des zweiten Satzes mit seiner absteigenden, in der zweiten Themenhälfte chromatisch intensivierten Basslinie scheint von grenzenloser Melancholie erfüllt. Gesteigert wird dieser Charakter noch vom Dur-Mittelteil des Satzes. Die Rückkehr nach Moll führt eine neue Begleitfigur aus Triolen und damit eine weicher fließende Bewegung ein—freilich nur, um in die Coda mit ihren trauervoll-stockenden Phrasen überzuleiten. Am 12. März 1781 wurde Mozart von seinem Dienstherrn, dem Fürsterzbischof von Salzburg, nach Wien gerufen, wo dieser mit seinem Gefolge während der Feierlichkeiten zur Thronbesteigung Kaisers Joseph II. weilte. Mozart war zur Vorbereitung der Premiere des Idomeneo seit dem vorigen November in München gewesen; am 16. März langte er in der österreichischen Hauptstadt an. Gleich am selben Abend sollt er ein Privatkonzert mit einigen der talentiertesten Salzburger Hofmusiker organisieren. Sein Ärger über den Erzbischof—der ihm die Erlaubnis verweigerte, öffentlich aufzutreten—, ist aus den Briefen Mozarts an seinen Vater aus jener Zeit zu ersehen. Drei Wochen nach seinem Eintreffen in Wien hatte Mozart Musik für den Salzburger Hofkonzertmeister Antonio Brunetti zu liefern. Er schrieb ein Rondo für Violine und Orchester (KV 373) sowie die Violinsonate G-Dur, KV 379. Letztere wurde in solcher Eile komponiert—laut Mozart in nur einer Stunde—, dass keine Zeit blieb, die Klavierstimme niederzuschreiben; bei der Uraufführung am folgenden Tag musste Mozart sie aus dem Kopf spielen. Trotz dieser Umstände ist es eine von seinen schönsten Violinsonaten. Schubert kannte sie gut; sein einziges Lied in Variationenform, Im Frühling, D 882, beruht auf einem Thema, das dem von Mozarts Variationenfinale sehr ähnelt. Die Sonate beginnt mit einem ausführlichen Adagio. Es bildet bereits einen Sonatensatz für sich aus, dessen Exposition wiederholt wird; doch bricht er dort ab, wo man die Reprise erwarten würde. An ihrer Stelle schreibt Mozart ein lebhaftes Allegro in Moll, dessen Durchführung mit gerade zehn Takten ungewöhnlich kurz ist. Das gleicht Mozart aus, indem er die Reprise verlängert und einen weiteren Durchführungsabschnitt einfügt, der die Musik auf ihr turbulentes Ende zu treibt. Die zarten Triller des Finalthemas sind nicht bloße Verzierung, sondern wesentlicher Teil der Melodie; in der einen oder anderen Form kehren sie anschließend in fast allen Variationen wieder. Die Ausnahmen bilden die erste Variation, geschrieben für Klavier allein, die das Thema in eine frei fließende dreistimmige Invention verwandelt, und die fünfte Variation, ein fein ausgearbeitetes Adagio, in dem das fantasievoll schweifende Klavier vom trockenen Pizzicato der Violine begleitet wird—ein sehr wirkungsvoller Einfall. Dem Adagio geht eine Moll-Variation voraus, und ihm folgt eine Wiederaufnahme des Themas, allerdings in flüssigerem Tempo. Die höhere Intensität, die sich so einstellt, gibt ihm einen ganz neuen Charakter; ebenso die Coda, die mit brillantem Figurenwerk beginnt, die Mozart aber in einen ganz schlichten Schluss führt. Die imposante Sonate Es-Dur, KV 481, vollendete Mozart am 12. Dezember 1785, nur vier Tage vor seinem Klavierkonzert KV 482 in derselben Tonart. Die von Jagdmusik-Anklängen durchzogene Schlussvariation des Sonatenfinales scheint das Finale des Klavierkonzerts vorauszunehmen, und die Schlusstakte des Kammerstücks haben tatsächlich orchestrales Gepräge. Der ungewöhnlich rasche Kopfsatz, ein Molto allegro im Dreivierteltakt, ist groß angelegt; er hat nicht weniger als drei kontrastierende Themen. Trotz dieses überreichen Materials basiert die Durchführung auf einem neuen Motiv, viertönig und in langen Notenwerten in der Violine. Besser bekannt ist es als Hauptthema im Finale der „Jupitersinfonie“. Wie so oft, wenn Mozart eigens Durchführungsthemen einführt, lässt er auch dieses in der Coda des Satzes wiederkehren. Der langsame Satz ist eine der tiefsinnigsten Kompositionen Mozarts; seine enharmonische Modulation zählt zu seinen gewagtesten Experimenten: Die Musik wechselt in kürzestem Zeitraum von der B- in die Kreuzregion und zurück, und die beiden Stimmen—sogar die beiden Systeme des Klavierparts—sind kurzzeitig in unterschiedlichen Tonarten notiert. Im Zentrum dieses Abschnitts erklingt das Hauptthema dieses As-Dur-Satzes im weit entfernten A-Dur—ein Ausflug in unbekannte Regionen, den Mozart in den Schlusstakten des Stücks wiederholt, wenn er innerhalb von nur sechs Takten von As-Dur nach E-Dur und wieder zurück moduliert. Die Ausweichung nach A-Dur gestattet es der Violine, kurzzeitig das Hauptthema zu übernehmen; im übrigen bleibt es dem Klavier vorbehalten, während die Violine sich zwischen dessen Ritornellen zu einer Reihe leidenschaftlicher Episoden aufschwingt. Das Hauptthema selbst erscheint im Lauf des Satzes immer feiner verziert, bis es bei seiner letzten Wiederkehr geradezu von Trillern verschleiert ist. Das Thema des abschließenden Variationensatzes wird eindrücklich vorgestellt: Beide Instrumente spielen es in Oktaven, während die linke Hand des Pianisten einstimmig begleitet. Diese durchsichtige Zweistimmigkeit gefiel Mozart so gut, dass er sie drei Jahre später im Variationensatz seines Divertimentos für Streichtrio KV 563—ebenfalls in Es—wieder aufgriff. In der Sonate entfalten sich die Variationen ganz ungezwungen und ohne Rücksicht auf die Tradition, dass jede Variation die vorige an Brillanz überbieten müsse. Lediglich in der vorletzten Variation wird die Musik mit lebhafteren Figurationen angereichert. Hier wählt Mozart eine doppelte Variation: In jeder Quasi-Wiederholung werden die Sechzehnteltriolen in der linken Hand des Pianisten durch noch raschere Notenwerte in der rechten ersetzt. Die Coda führt in eine Schlussvariation im Jagdstil.